Storm Solutions Roofing has been a trusted name in roof repair for St. Charles residents for over a decade. We service zip codes 63303 and 63304 with fast, high quality roof repairs and replacements. Why get your roof repaired with Storm Solutions Roofing? With so many roofing companies out there, why should you trust Storm Solutions Roofing with your St. Charles home? Our roofing is GAF Master Elite certified. GAF certification is held by only 3% of all roofing companies in the United states. When you go with us, you are assured that you are working with one of the top roofers in America. We are a local roofing company. 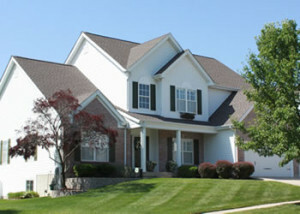 We live here and are familiar with what St. Charles homeowners need. We take pride in the community and our work reflects that. We do free roof inspections for St. Charles homes. Do you have a leak? Did a big storm just roll through? Has it been a few years since your home was inspected? Call us today and have a Storm Solutions inspector come look at your roof. We will do a thorough inspection to isolate any maintenance or roof repair items that can be done to protect your investment. We will inspect any roof for damage in 63303 or 63304 at no cost or obligation. Give us a call today for a free inspection and estimate for your St. Charles roof repair.